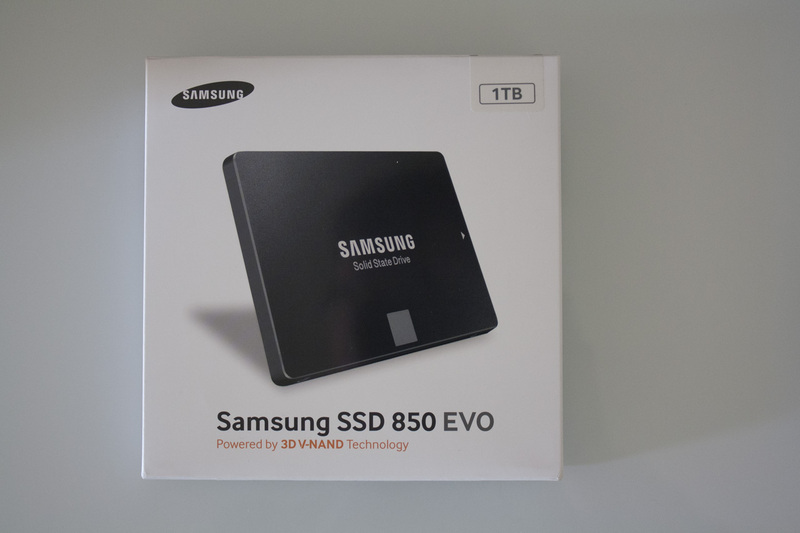 I recently bought a Samsung 840 EVO on Amazon – a great deal at £90 for a 250GB solid state drive, or so I thought. A few days later, I was offered the chance to review the 850 EVO, and of course I couldn’t pass that up – especially as I now had the perfect means to see exactly what’s changed in the new generation. 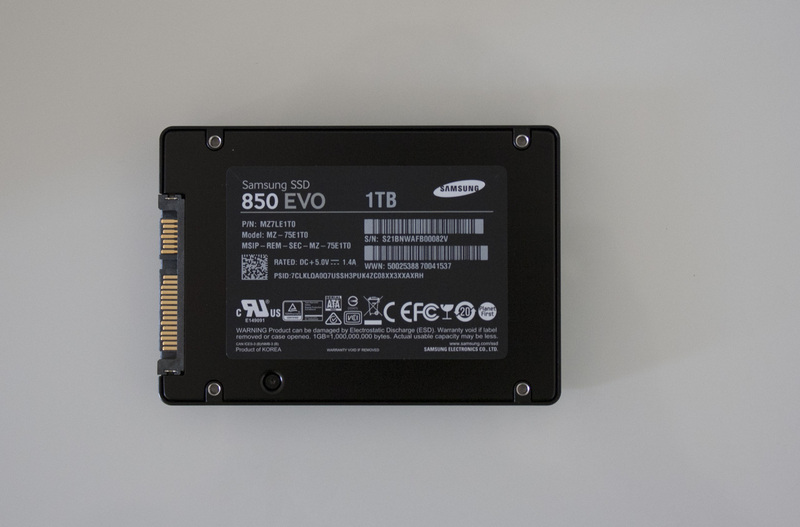 The 850 Evo promises improved speeds and aggressive pricing thanks to its vertically stacked (3D) NAND. Today, we’ll find out if it’s a true improvement over the 840 series, or just marketing hype. Let’s go. 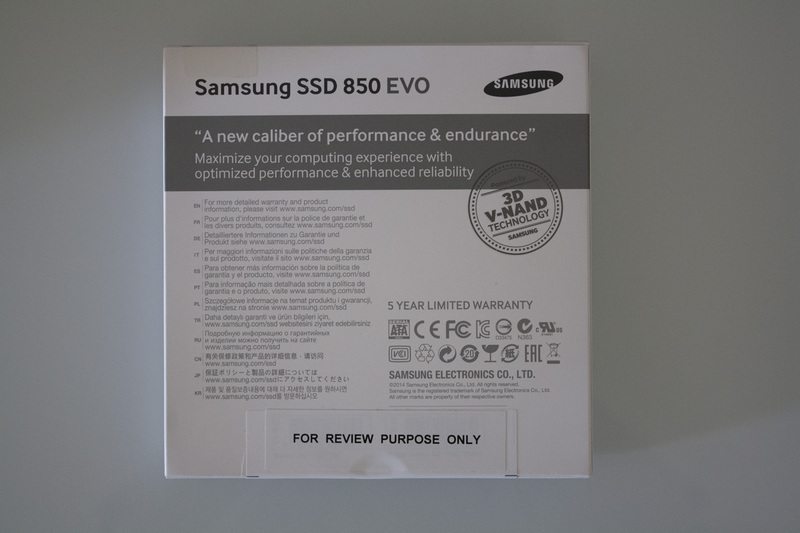 The Samsung 850 EVO comes in a pleasant white box, with the capacity marked and a proud ‘powered by 3D V-NAND Technology’ mention. On the back, we have some assurances of “a new caliber of performance & endurance” and a nice “for review purpose only” sticker. Ooh, exclusive. 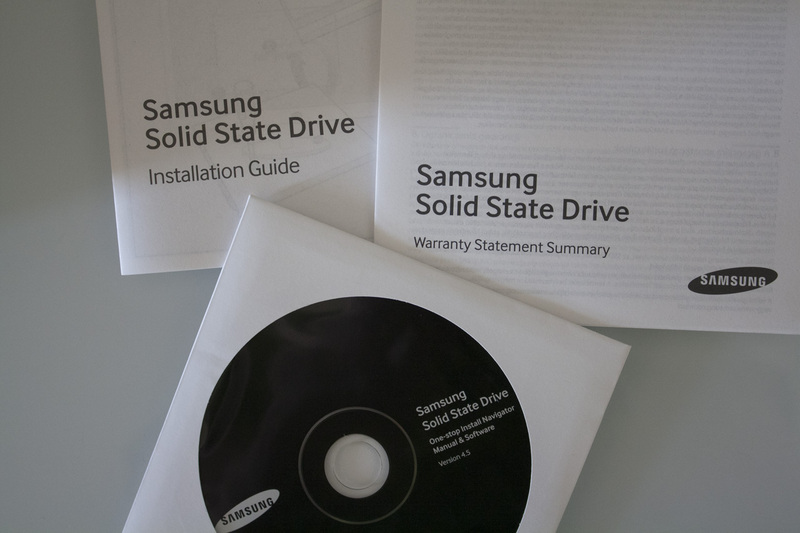 Inside the box, we find the SSD and the above – an installation guide, warranty statement and manual / driver CD. Our first view of the SSD! It’s black, with Samsung written in white and Solid State Drive in grey. It’s the standard 2.5-inch size, of course. The back is a little more exciting, showing various model numbers and regulatory information, as well as that 1TB capacity. Finally, here’s a nice render of what the inside looks like. That’s about it for design, so let’s move onto the fun part – testing! As there’s little real-world analysis to be done, we’ll be strictly in benchmark land for the majority of this article. 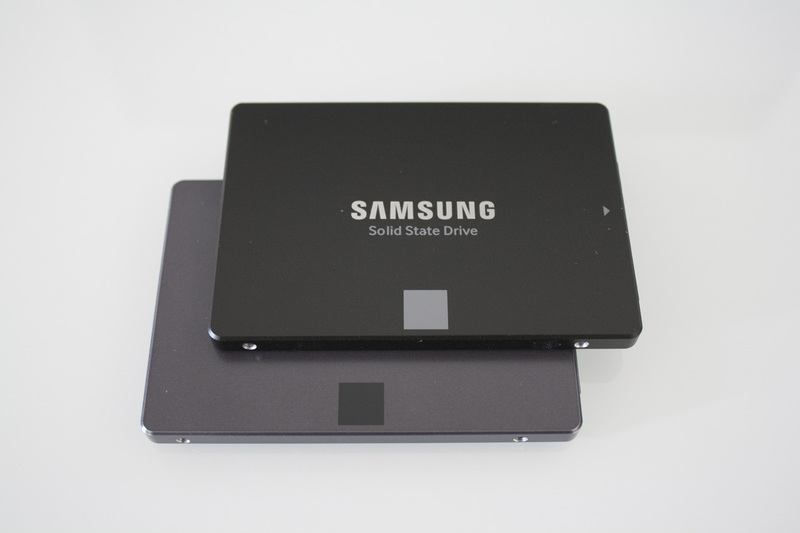 We’ll be testing the two Samsung drives – and a third Corsair drive, the most recent that I’ve tested – in a battery of tests to see which is the fastest. All drives are empty for the tests, and Windows is run on another SSD. The test rig has a Core i7 2600K processor and 16GB of RAM; the OS is Windows 10. Note that Samsung’s RAPID caching was not used for these tests, as it doesn’t appear to support Windows 10. 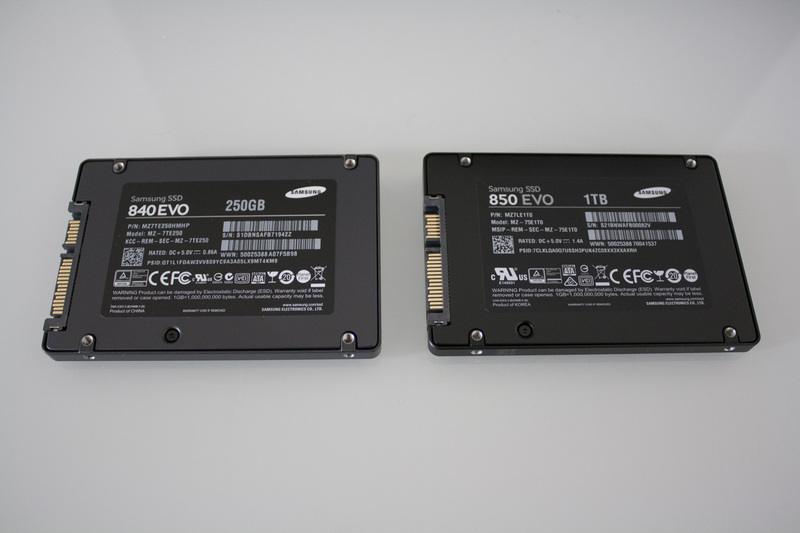 Our two principle test subjects: two brand new Samsung SSDs, the 840 Evo and 850 Evo. In our first result, we see a fairly disappointing sign – the 850 provides only a marginal increase over the 840, with the only noticeable deltas coming in the 512K write test and 4K queue depth 32 test. Otherwise, the two drives are a stone’s throw from each other. The biggest gains from the 840 to the 850 come in the higher queue depth sector, with the 850 recording scores 16% higher in the read test and 44% higher in the write test. Otherwise, the two drives are tough to separate, although both are better than the older Corsair drive. The two Samsung drives are near identical in these benchmark results, with the 840 taking a lead early on in the read test but losing out later on; in terms of write speeds the two drives are basically equivalent. Here the Samsung 850 Evo shows its best results yet, with a small but noticeable lead in average read speed and burst read speed over its older brother. While the Samsung 850 Evo proved both dependable and powerful across our battery of tests, I can’t help but be disappointed. I had expected a greater increase in performance from the new 3D NAND arrangement, instead of what amounts to marginal updates and even a few small regressions. While the difference in price is small, for the moment I’d advise that you go for the cheaper and more widely available 840 Evo models instead of these newcomers.